Last night I attended a lecture sponsored by the Bedford Audubon Society. The speaker, who was from National Audubon HQ, described their new flyway strategy. The basic strategy is simple. Many of our local birds spend their winters in Central and South America. Audubon has long focus on preserving important bird habitat here in North America. But all their effort will be useless unless the bird habitats in Central and South America are destroyed. In order to save birds, key areas must be protected in both here and in Central and South America. Makes sense. Birds spend half their time here and half down there. An interesting approach is to focus on 35 key species. Insuring the survival of these 35 key species will also benefit most other species. For the key species, they choose birds that human can feel close to and care about. 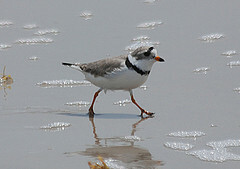 One of my favorites, the Piping Plover, is on the list. 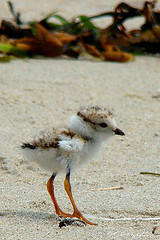 If you have ever seen a Piping Plover you know they are adorable little birds, hard to resist. And the young are even cuter. Unfortunately they have been endangered for some time. The speaker surprised me by stating that there are only about 8,000 in the world. They nest on Long Island shoreline and in Massachusetts. I’ve been lucky enough to see some of them. Recently Audubon discovered that about 20% of the population winters in the Bahamas. And, working with the government, they have achieved protected status for some of the bird’s favorite locations. I, for one, hope they can save the Piping Plover for future generations to enjoy.